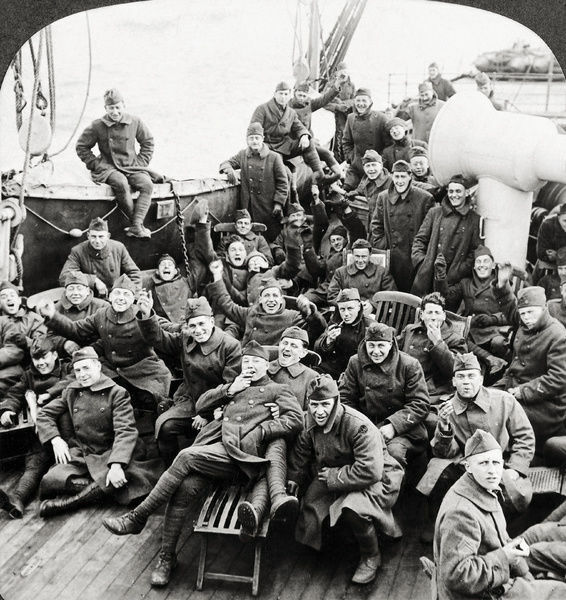 The Armistice, signed on November 11, 1918, brought an end to the fighting of World War I, but the Treaty of Versailles, which ended the state of war between Germany and the Allies was not signed until June 28, 1919, and the Welcome Home Celebration for the returning soldiers and sailors in Hudson didn't happen until September 1919. 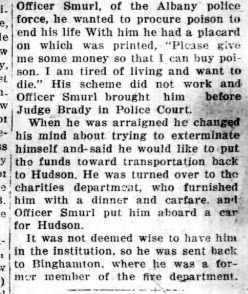 As 1918 ended and 1919 began, the people of Hudson were still very much preoccupied with the war, and for this reason Gossips is going to continue this series, periodically sharing war-related items that appeared in local newspapers a century ago. On Christmas night 1918 there was a Victory Ball at the armory in Hudson to raise money for the reception fund for returning soldiers and sailors. 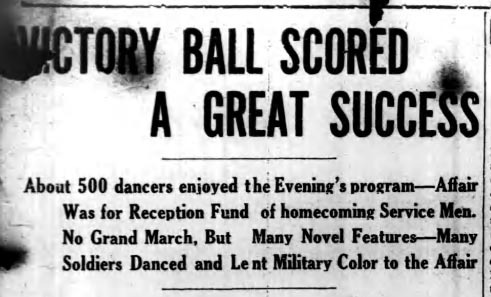 On December 31, 1918, the Columbia Republican, which was a weekly newspaper, featured an article about the ball on its front page. 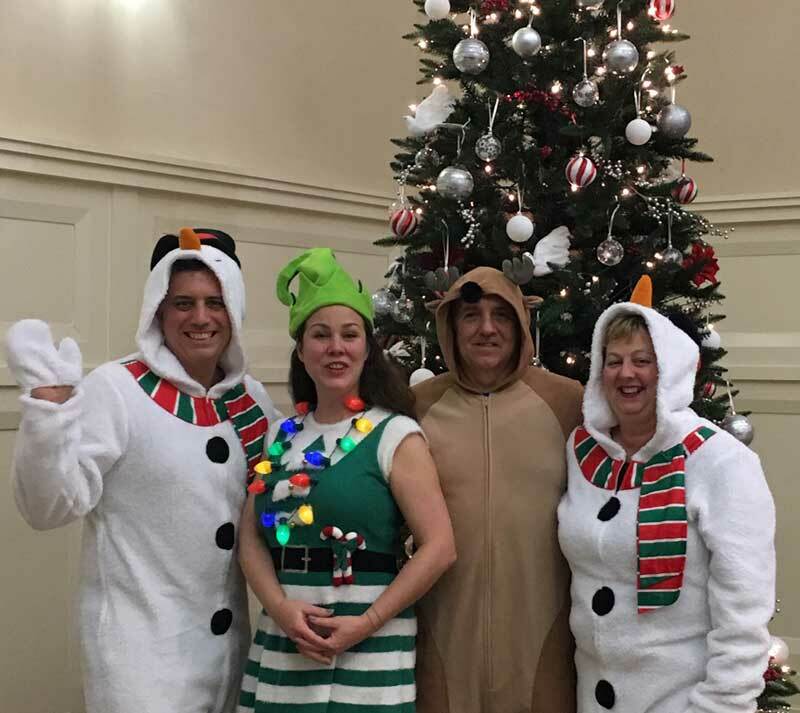 The Victory Ball held at the State armory topped Christmas Day with one of the best social events of many months. Before 8 o'clock a continual parade of dancers marched in to the spacious armory. Many who did not dance went to look on and visit among friends. The overture began at 8 o'clock and until 9 o'clock an unusually good concert program was given by Stafford's orchestra. A number of soldiers and sailors were present in their uniform, gave a military touch to the affair. At 9 o'clock the dancing began and continued until 2 in the morning. There were twenty dances and two extras given. The music was up-to-date and the fantastic toes stepped in harmony to its rhythm. About five hundred people were in attendance. The armory was prettily decorated with Christmas greens and National colors. There were several boxes erected and were occupied by a large number of persons. For the first time there was no grand march held. At different times during the dance program spotlight numbers were given which added variety to the program. The ball was held for the benefit of the fund for the reception of homecoming service men and close to $600 was realized. The committee in charge deserves great credit for the capable and efficient manner in which the ball was conducted. The affair was a great success and the appreciation shown by those who patronized it is deserving credit. . . . Sadly, I know of no photographs that were taken at the ball. Hudson is ready to greet 2019. The city clock is working again! Thank you to whomever it is at the Department of Public Works who climbs the tower and winds the clock. 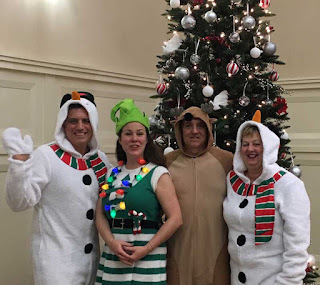 Tomorrow is New Year's Eve, and there's reason for concern about whether or not, at the stroke of midnight, we in Hudson will be able to ring out the old year and ring in the new. Sometime last week, the clock in the steeple of the First Presbyterian Church stopped, its hands showing quarter past one. The clock in the steeple of the First Presbyterian Church is the official city clock, a tradition that started in 1802, when the First Presbyterian Church was located at Second and Partition streets, so when this clock stops it's kind of a big deal for many. The question is: Will the clock be running again in time to ring in 2019? 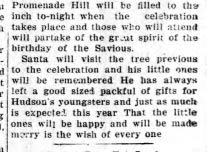 This news item appeared on the front page of the Columbia Republican for December 31, 1918--New Year's Eve. It seems particularly pitiful because all of this happened during the Christmas season. 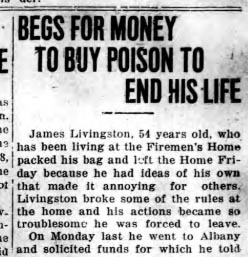 I tried to discover the fate of James Livingston once he returned to Binghamton, but no Binghamton newspapers are available at FultonHistory.com for the period in question. Lately, I've been spending time reading Common Council minutes from the end of 1918 and the beginning of 1919. My purpose in doing so is to learn the outcome of the proposal from a mysterious concrete ship building company "too closely allied with the government" to lease the Kennedy dock. My curiosity had been piqued by the account of a public hearing on the proposal which appeared in the Columbia Register on November 19, 1918. I haven't come to the end of that quest yet, but in the process I learned that on April 24, 1919, the Common Council passed the following two pieces of legislation. It shall be lawful in the City of Hudson to exhibit motion pictures after 2 o'clock in the afternoon on the 1st day of the week. It shall be lawful in the City of Hudson to play baseball games on the first day of the week after 2 o'clock in the afternoon, and to witness which an admission for may or may not be charged. The first day of the week, of course, is Sunday. The first ordinance, regarding movies, passed with nine aldermen voting in support and only one alderman, John McLaren, who represented the Third Ward, voting against it. The discussion that preceded the vote is of interest. Before the adoption of the ordinance Alderman McLaren said that he did not believe that the ordinance was in the interest of the laboring man, but that the whole sum and substance of the matter was commercialism on the part of the motion picture interests. He felt that Sunday was no day for such exhibition, and that the so called working man did not want them. Alderman Dixon believed that they were very much wanted by those who were not fortunate enought [sic] to own a motor car, and he felt that they should be allowed the privilege of attending a motion picture show. Alderman Muldowney suggested an amendment to the ordinance, inserting a provision that the prices for Sunday pictures should not be raised. The Recorder felt that the Council was without power to establish a scale of prices, and that its only province was to say whether or not motion pictures should be exhibited on Sunday. Mr. James J. Brennan, appeared for the Playhouse management and its stakeholders, and stated that the prices would remain the same on Sunday as on week days. 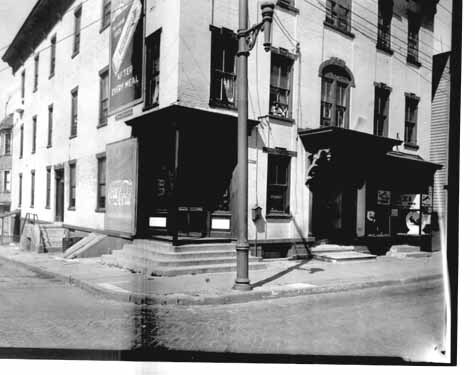 The Playhouse, which seated 1,500, stood at 347 Warren Street, the current site of BackBar. It was built in 1912. 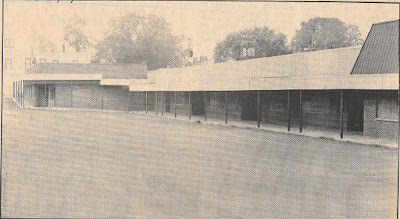 The photo above shows the building in 1922. The Playhouse was destroyed by fire in February 1938. 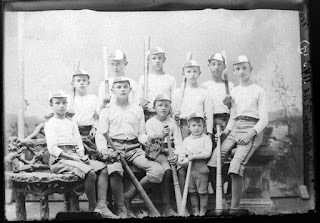 Although Alderman McLaren voted against showing movies on Sunday, he supported playing baseball on Sunday. He felt compelled to explain why, and his explanation was duly recorded in the minutes of the Common Council. Alderman McLaren desired to explain why he voted NO on the adoption of the motion picture ordinance, and YES on the baseball ordinance. He stated that baseball was an outdoor sport, and a game which brought people out into the open. It was not possible for the laboring man to enjoy baseball games, because he was employed during the hours of the day, and the game could not be played in the evening, whereas motion pictures might be enjoyed both during the afternoon and the evening. It was concern for the enjoyment of the laboring man and not for preserving the sanctity of the Sabbath that motivated Alderman McLaren in his votes. With ShopRite now a mile farther up the road (and the shopping experience there getting mixed reviews), we need the farmers' market and Rolling Grocer 19 more than ever. But, alas, neither is now available to us. 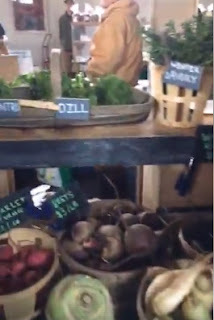 RG19 is on hiatus for the holidays, and the indoor farmers' market ended its December run last Saturday. But there is good news! RG19 resumes its regular schedule on Wednesday, January 9. Click here to remind yourself what that schedule is. The farmers' market returns to Hudson Lodge at 601 Union Street on Saturday, February 2. Mark your calendars. 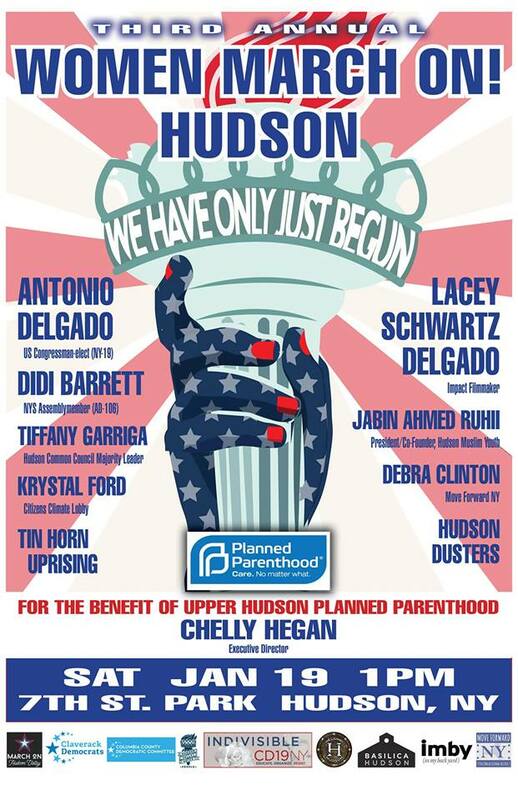 Three weeks from today, on Saturday, January 19, the third women's march will take place in Hudson. (I refuse to call it the "third annual," because I hope this event doesn't have to go on forever.) 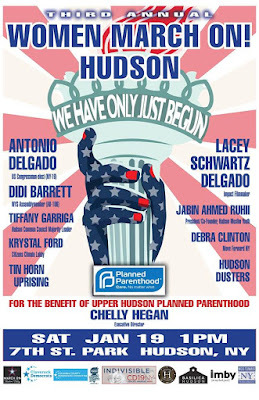 Featured participants in the 2019 march will be Congressman Antonio Delgado and Lacey Schwartz Delgado. This evening, Gossips received a press release from the Germantown Waterfront Advisory Committee about a meeting that has been scheduled regarding the Amtrak proposal to install fences and gates along the Hudson River. The most salient parts of the press release are quoted below. The New York State Department of Transportation and Amtrak have scheduled a meeting in Germantown for Amtrak to present its plans and reasoning for installing fencing and gates along the Hudson River in Dutchess and Columbia counties. The meeting is scheduled for Tuesday, Jan. 29, and is tentatively set to go from 5 p.m. to 7 p.m. at the Kellner Community Activities Center, 50 Palatine Park Road, in Germantown. An inclement-weather date has been set for the following Tuesday evening, Feb. 5. The format of the meeting is unclear, as is the degree to which public comment during the meeting will be sought or considered. . . .
Robert Beaury, Germantown's town supervisor, has requested the meeting's start time be shifted to 6 p.m. to ensure people working until 5 p.m. can attend. To confirm the start time, people should check GatesGate.org or the Germantown Waterfront pages on Facebook or Instagram leading up the Jan. 29. . . .
Lee Park, a spokesman for the state Department of State, said the scheduled deadline for declaring whether Amtrak's proposed project is consistent with New York's coastal management policies--which among other things encourage increased access to public waterways--is February 8. But, he added, the schedule could be amended with a mutual agreement with Amtrak. The review period was extended multiple times in 2018. Asked if a representative from the state's Department of State will be in attendance to observe at Germantown's January 29th meeting, Park said, "We look forward to the meeting and expect to have representation there." . . . The state's Department of State requested that the state's Department of Transportation hold at least two public informational sessions for the Amtrak proposal. Mr. Park said recently that, "the information presented during Amtrak's informational sessions will determine whether DOS may hold a second public comment period." For more information and context on Amtrak's proposal and the opposition it has sparked throughout 2018, please visit GatesGate.org. Gossips has written many times about the fountain, surmounted by a statue of Venus rising from the sea, which originally graced the Public Square. The most recent post, published on December 22, reproduced an article that appeared in the Hudson Evening Register on September 11, 1883, describing the fountain in detail--both the statue and the pedestal on which it stood. 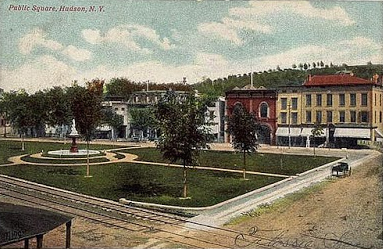 Today, HudsonValley360 has an article about the aspirations of two men, Charles Rogers and Garrett Roche, who "want to see the statue restored to the top of the fountain in the 7th Street Park": "Will Venus statue rise again?" I have long been an advocate for the return of the fountain to the Public Square, but I won't be satisfied with just plunking our much abused and twice repaired Venus into the center of the 1974 "Inspiration Fountain." I want the entire fountain back the way it was in 1883--pedestal and all. I want to see the return of the fountain that was a source of civic pride in 1883, of which the Evening Register said, "to be fully appreciated, it must be seen when the water in full force is playing through the numerous jets and rising and falling in fantastic forms." The two efforts to repair the statue, after it was vandalized in 1978 and crashed into by a drunk driver in 1979 (both incidents occurred when the statue, no longer part of the fountain, stood independently in the northwest corner of Seventh Street Park), involved "filling all internal cavities with cement, plaster and epoxy and welding in heavy reinforcing rods." Because of these efforts, it is unlikely the statue could ever be restored to its original glory, with water spouting out of the statue itself, but the statue could be recast (this article explains how it could be done), and the pedestal could be re-created. 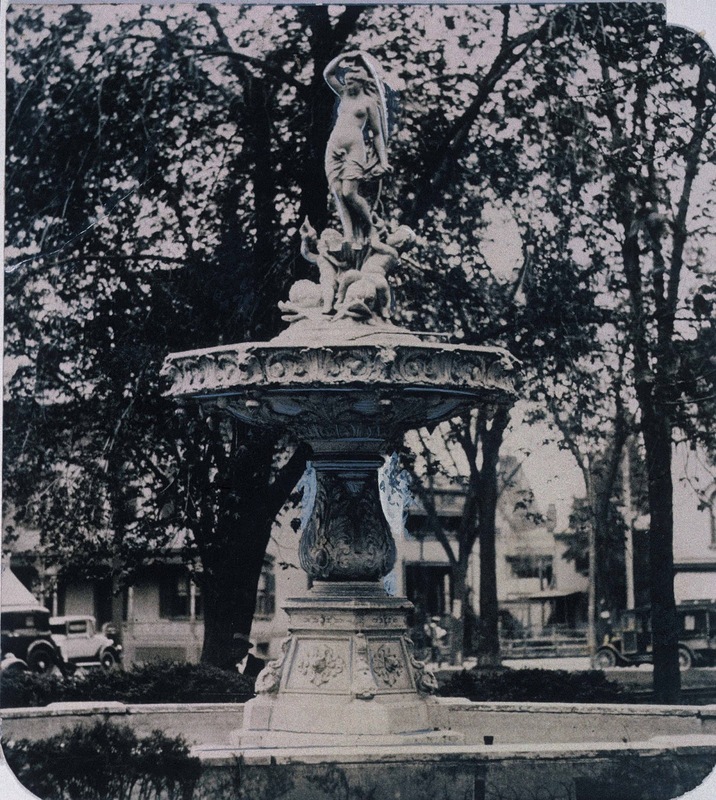 The Evening Register article from September 11, 1883, provides the dimensions of the original fountain, and this photograph from the Evelyn and Robert Monthie Slide Collection at the Columbia County Historical Society provides photographic evidence of the details of the design. Wouldn't it be lovely to have this elegant fountain back at the center of the Public Square? 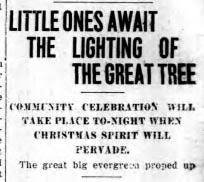 On Christmas Eve, Gossips shared an item from the Columbia Republican for December 24, 1918, telling about the Christmas tree lighting that was to occur later that day. 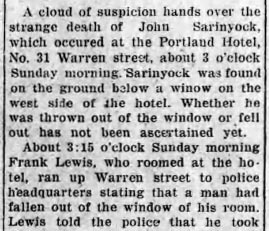 That same day, the Republican carried an account of something of a very different nature that happened in the wee hours of Sunday, December 22, just a block away from Promenade Hill, at the Portland Hotel. 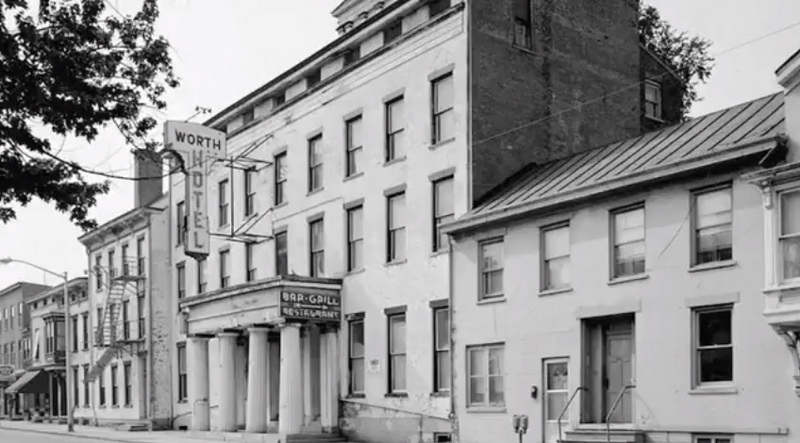 The Portland Hotel, also known as Hotel Portland, was located on the southwest corner of Warren and First streets. It is not clear which of the photographs below shows what the hotel looked like in 1918. The first picture is from the booklet Illustrated Hudson, N.Y. and shows what the hotel looked like in 1905. At that time, the Hotel Portland, which was originally known as Waldon House, had recently been acquired by O. 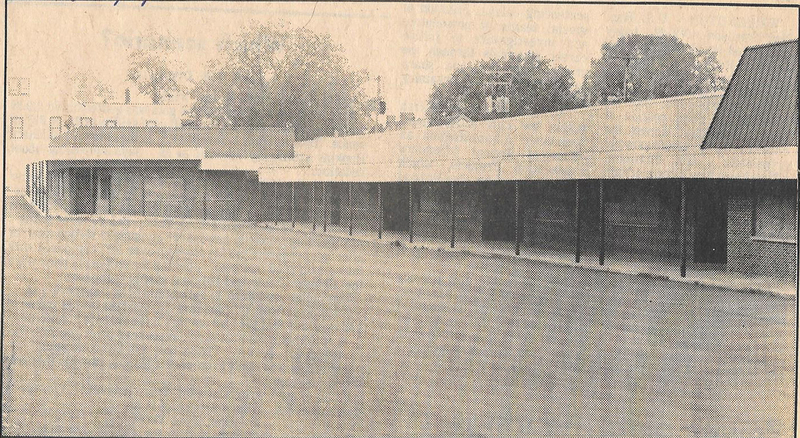 A. Quackenbush, who "entirely remodelled it and made it thoroughly up-to-date in every respect." Quakenbush's proprietorship was short-lived. In March 29, 1906, the Columbia Republican reported that the hotel had been sold at auction on the steps of the courthouse. The person acquiring it was "Anna R. Rightmyer, wife of J. Clarence Rightmyer, who held a mortgage of $5,930 against the same. Through her attorney she bid $2,000 over the amount of the mortgage." 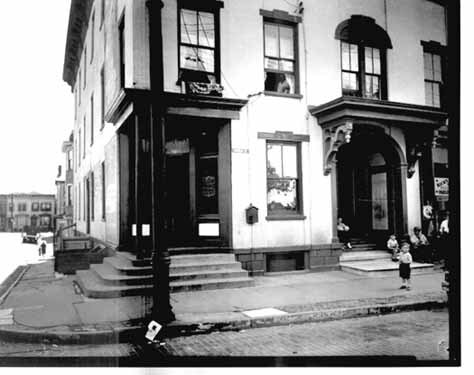 Although the old newspapers at FultonHistory.com provide no clue about when the corner entrance and the storefront were added to the building or when the portico over the central entrance lost its balustrade, they do provide some hints about what the hotel was like over the years. M. Parker Williams, who was for the latter half the 19th century the editor of the Hudson Evening Register, lived at the beginning of the 20th century with his wife at the Hotel Portland, "where the family had taken an apartment on giving up their old home on Union street." 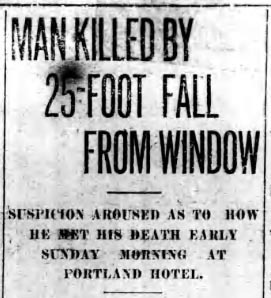 At the age of 80, Williams died at the Hotel Portland on April 26, 1906, after a year long illness during which he had been "faithfully attended . . . by Dr. Tracy and a nurse." In December 1904 the Columbia Republican reported that, after a great Masonic convention at St. John's Hall, where in attendance was a delegation of a hundred Albany Masons who "had with them their famous bucking goat," there was a banquet for the Masons at the Hotel Portland. "It was one of the best that has been attended here in a long time. The tables were tastefully decorated and the best of everything that goes with a banquet was served by a corps of waiters who were attentive to the wants of the diners." The banquet went on until after midnight, at which time the Albany delegation--all one hundred of them, presumably with the goat in tow--headed for the train station. The Republican reports: "The fast train due here at 12:37 a.m., and which is not scheduled to stop at Hudson, came to a standstill when it arrived and the Albanians got aboard and left for home well pleased with their visit." 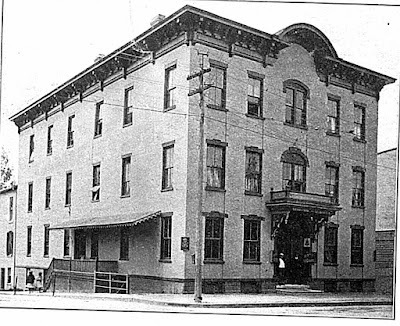 In October 1907, the Hudson Evening Register reported that the Columbia County Democratic convention, to nominate candidates for local office, was held at the Hotel Portland. In Thursday, October 7, 1915, the Register announced that there was to be a dance that evening at the Hotel Portland, then once again under new management. Music for the evening was to be provided by "a Valatie orchestra." The Portland Hotel was demolished during urban renewal to make way for "Parkview Plaza," a strip mall built in 1975 with the hope of luring shoppers back to Hudson from the malls of Greenport. Its promise was never realized. Like the Portland Hotel in 1906, the "mall" was foreclosed on in 1978 and sold at auction. These days, a Christmas tree is erected in Seventh Street Park, behind the iron fencing, where the Venus fountain once stood. It goes up in time for Winter Walk, and unlike the menorah, also in the park, the Christmas tree doesn't get an official lighting ceremony. Once it's up, the lights go on automatically every day around sunset. This wasn't the case a hundred years ago. 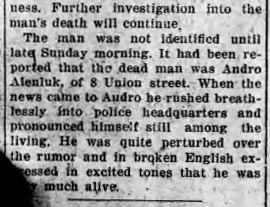 What happened then is described in this news item discovered in the Columbia Republican for December 24, 1918. We all know the Empire State Trail is coming through Hudson. Entering from the north on Harry Howard Avenue, it will go down the Dugway to Mill Street and on to Dock Street, then turn left onto Front Street to Allen Street, then east on Allen Street to Third Street and on out of the city. 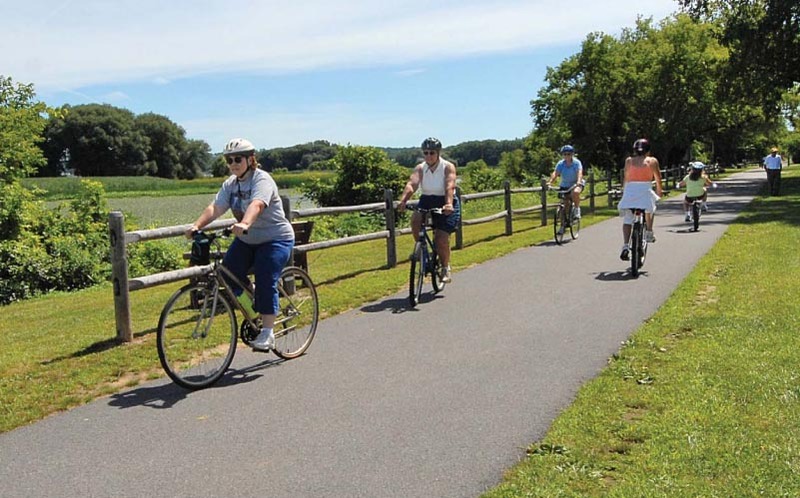 In Hudson, the trail follows city streets. 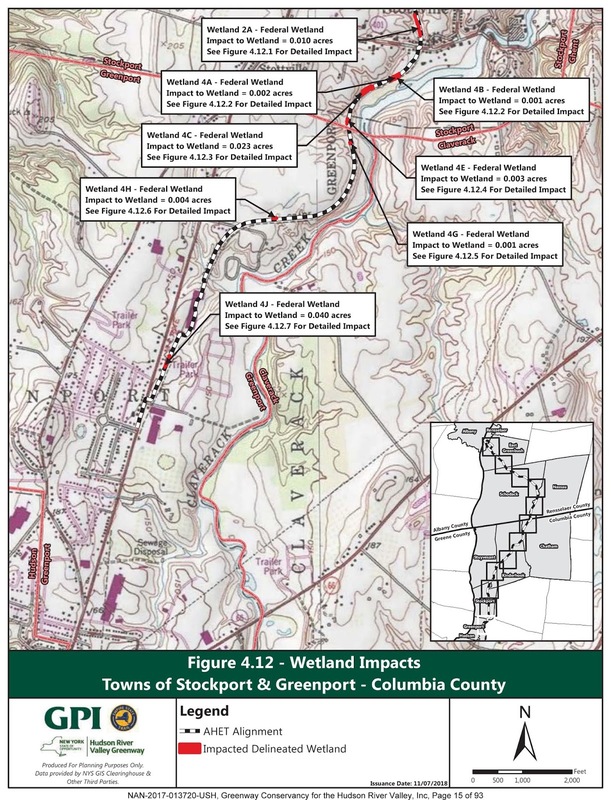 The work would involve the discharge of fill material into a total of 2.04 acres of wetlands, including palustrine emergent (1.79), scrub-shrub (0.23), and forested (0.01) wetlands, and 968 linear feet of stream channel, for the construction of a 36-mile pedestrian and bicycle trail. The trail would be comprised of 27 miles of off-road, utilizing the alignment of a historic trolley route that is currently maintained as an electric utility corridor, and would include the construction of six bridge crossings. The bridge crossings would be constructed over the Moordener Kill at one location and over the Valatie Kill at five locations along the proposed alignment. The remaining 9 miles would be comprised of on-road bike paths, sidewalks, and sidepaths, utilizing local, county, and state roadways where improvements would be made as needed to provide safe crossings and minimize conflicts with motor vehicles. 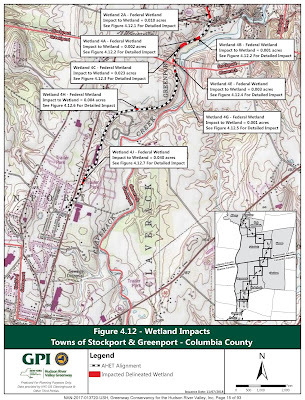 The map below shows the wetland impacts in Stockport and Greenport. 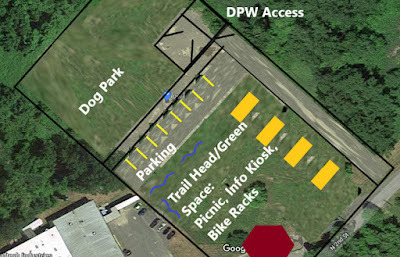 Click on the image to enlarge it, or click here to see the full document, which includes a map of each segment of the thirty-six miles of trail. The ACE is now soliciting public comments on the proposed project to be used "to assess impacts on endangered species, historic properties, water quality, general environmental effect, and other public interest factors." Comments can be submitted electronically to Brad.Sherwood@usace.army.mil. The deadline for submitting comments is Wednesday, January 16. Last night, a Gossips reader slipped what I considered to be a Christmas gift through my mail slot. 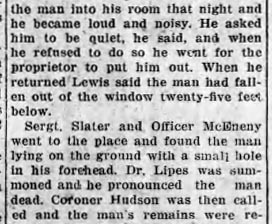 It was a photocopy of an article that appeared in the Hudson Evening Register on September 11, 1883. The article was familiar to me--it was one I have shared on this blog before--but, since the interest in revitalizing the Public Square and restoring the Venus fountain continues unabated and ungratified, I was inspired to share it again. It provides some precise and valuable information about the fountain, should anyone want to undertake to reconstruct it. An Ornament to the City and a Monument to Public Spirited Citizens--a Description of the Work of Art, and who were Instrumental in Procuring it. Now that the beautiful fountain in Public Park is nearly completed and our citizens have enjoyed the sight of "Venus Rising from the Sea," exhibiting in the most effective manner the power of our water supply, and proving that it can be put to ornamental as well as useful purposes, it is proper to speak in detail of this work of art, and award credit to those who were chiefly instrumental in procuring it. The total height of the fountain, including the foundation, is eighteen feet. The pan is a gurgoyle [sic] octagon, eight feet five inches above the base; diameter of pan, eight feet eleven inches. The ground basin is twenty-five feet in diameter. The foundation is of Coral Marble, handsomely cut, from the quarries of Supervisor Fred. W. Jones, and was donated by that energetic and public spirited gentleman. The foundation is capped by a fine slab of Vermont marble, which was generously donated by Mr. Patrick Hoctor, of the Hudson Granite and Marble Works. From this rises the base surmounted by the figures, all in graceful proportion and artistic design. But to be fully appreciated, it must be seen when the water in full force is playing through the numerous jets and rising and falling in fantastic forms. 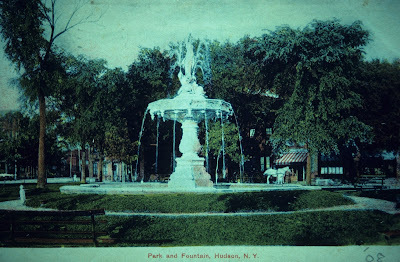 Mr. D. Martin Haviland is entitled to much credit for his persevering efforts in securing to the city not only this beautiful fountain, but the handsome park in which it is located. One of the most unsightly spots in the city has within a few years been converted into one of the most attractive. In this enterprise Mr. Haviland's efforts have been generously seconded by the Boston & Albany Railroad Company, by the action of our Common Council, by the contributions of citizens, and by the local press. At the outset we said the fountain was nearly completed. It only lacks the finishing touches of the artist's brush. That, we understand, Mr. Silas W. Tobey, the veteran artist, has volunteered to do, and this assurance is sufficient guarantee that the work will be well done and in keeping with the fountain and its surroundings. 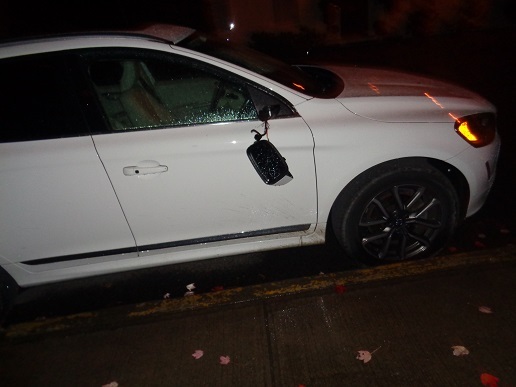 In the early hours of November 13, a vandal or vandals damaged twenty-two cars parked on South Front, First, Second, Warren, and Union streets. In most cases, the side mirrors were bashed. One car had its driver's side window smashed. 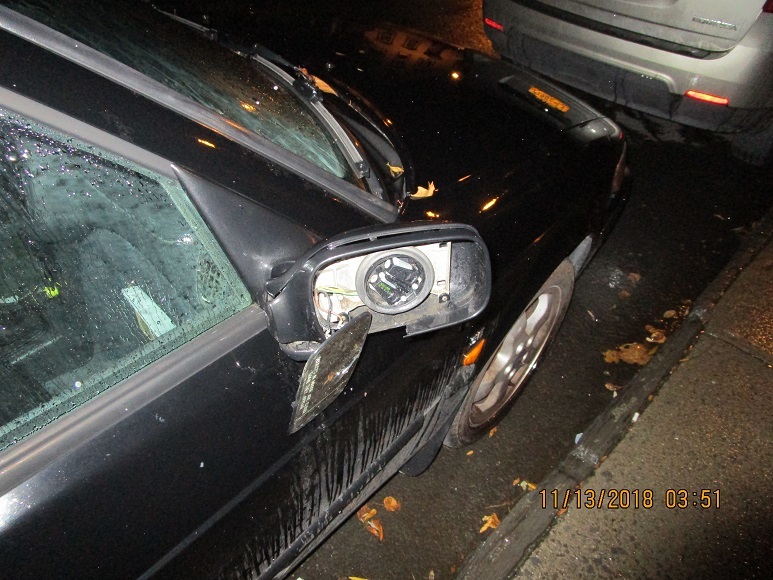 Last night, at least six cars parked on South Second Street and on Partition Street--in more or less the same part of the city where the incident happened in November --were similarly damaged. That's all the information Gossips has at the moment. More will follow, when it becomes available. In September, the City of Hudson adopted a law, Local Law No. 7 of 2018, which requires the owners of vacant buildings to register those buildings with the code enforcement office and pay an annual fee every year the building remains vacant--$1,000 for the first year, increasing by $1,000 each year to $5,000 for the fifth year and every year thereafter. It was believed the law would discourage people from warehousing property and encourage them to rehab buildings and get the housing units back on the market. Gossips learned recently that, three months later, only one vacant building has so far been registered. That is because the language of the law puts the burden of reporting vacant buildings on residents. 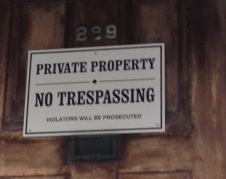 The following is quoted from the law (italics added by Gossips): "The Code Enforcement Officer may identify vacant buildings through its routine inspection process as well as through notification by residents, neighborhood associations and other community groups that a building may be eligible for inclusion on the registry." 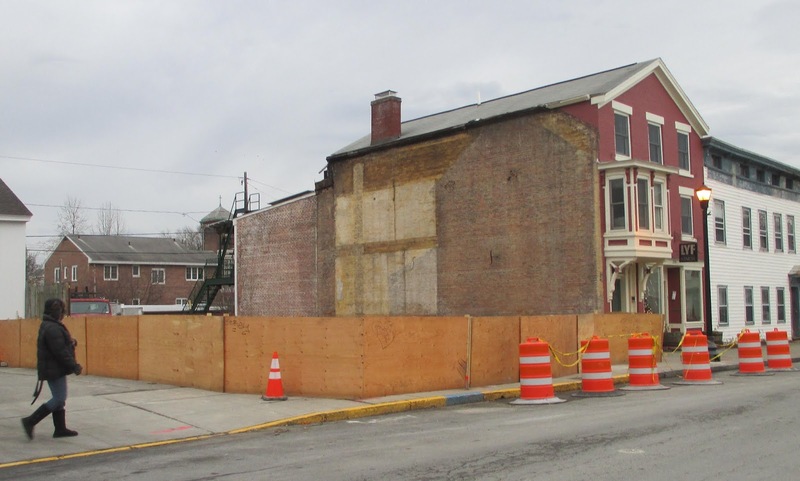 So, if there's a vacant building in your neighborhood that is worrisome and annoying, you should report the address to the code enforcement office: hudsonceo@cityofhudson.org. You can read about it on Volo's blog, FourthWardHudson.com. 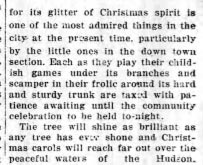 News items that appeared in the weekly Columbia Republican for December 17, 1918, provide a snapshot of life in Hudson during the week before Christmas, a century ago. 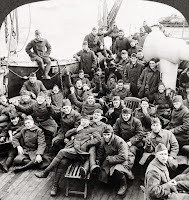 The Armistice on November 11 had ended the fighting of World War I, but the Spanish flu pandemic continued. 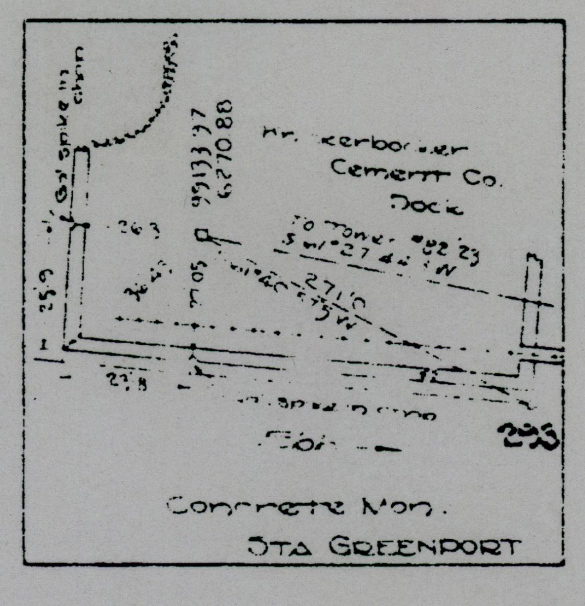 The newspaper reported that on December 11, the mother of William Graf, who lived on North Sixth Street, received an official telegram informing her that her son had died on November 29 in France of empyema, as a consequence of contracting influenza in early October. The paper that day was also reported that eighteen children were now in the care of the county, orphaned by the flu epidemic. The articles that appeared in the Columbia Republican for that day also include a tragic coincidence. 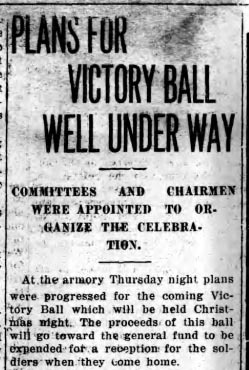 An article on page two reported on a meeting that had taken place the previous Thursday to plan a Victory Ball to be held on Christmas night at the armory. The article went on to the name the people who had been appointed to the planning committee and an advisory committee for the event. Among the people appointed to the latter committee was Edwin W. Ensign, whose specific role was to be "chairman of chairs." Tragically, the front page of the paper reported that, on that same Thursday night, Ensign died in a fire that destroyed his summer cottage on Lake Charlotte. The cause of the fire has not been learned, but it is believed that either the lamp or the stove set fire to the room and Mr. Ensign was suffocated before he could make his escape from the flames. When the remains were picked up, evidence showed that the body rolled out of bed and was lying face downward. Filling from his teeth and keys were found embedded in the ground under the body. One of the keys, which belonged to the Elk's lodge, was partly melted. 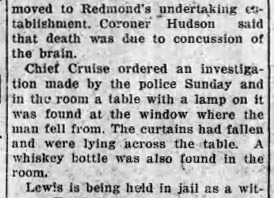 The account of Ensign's tragic death includes the information that his twin sons, Edwin J. and David, who were described as "young children," were both "suffering an attack of influenza" at the time of their father's death. 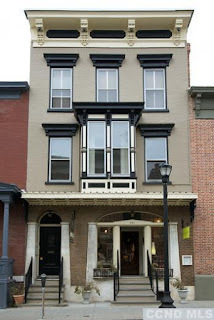 The funeral parlor of Ensign & Bates was located at 444 Warren Street. In the year after Ensign's death, Bates formed a new partnership with Neal M. Anderson, and the firm became known as Bates & Anderson. 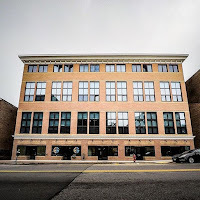 Yesterday, Chronogram published an article called "4 Places to Apply for Affordable Artist Housing in the Hudson Valley." 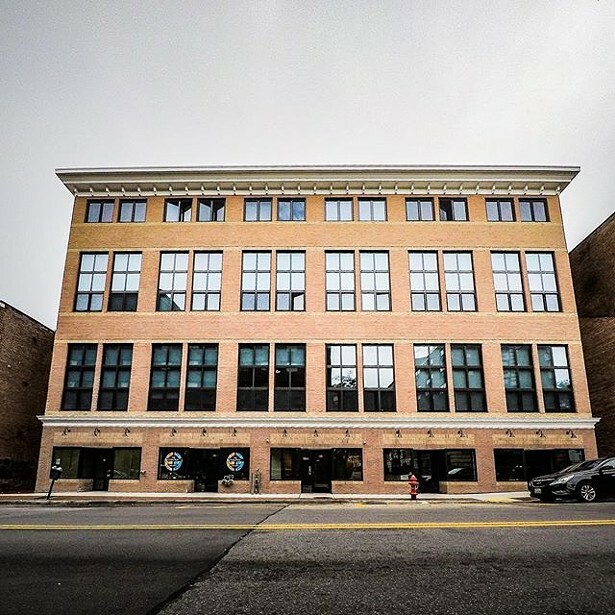 Two of the four places--Queen City Lofts in Poughkeepsie and Lofts on Main in Peekskill--are new LEED-certified buildings constructed and managed by Kearney Realty & Development group. Kearney, it will be remembered, was one of three developers submitting proposals for the former Kaz site. Their proposal was for a complex of four buildings, which they proposed calling "The Landing," providing "all kinds of housing, 'with not enough of any one type to stigmatize it.'" At the beginning of November, the building that had stood at 211 Warren Street for two centuries or more had to be demolished. Yesterday, a new foundation was poured at the site. Curious to know what the plans were, since no new proposal for the site had been presented to the Historic Preservation Commission, I asked code enforcement officer Craig Haigh about it. He told me that a permit had been issued only to pour the foundation, which was necessary to stabilize the earth around the property. No further work will be done until spring, and a certificate of appropriateness will be required before that work can begin. It seems a new building will rise in the footprint of the one that was lost. A reader alerted me to this article, which appeared today in Bloomberg Business: "Rising Waters Are Drowning Amtrak's Northeast Corridor." The article reports the conclusion of A "three-volume, multiyear climate study undertaken with first Booz Allen Hamilton Inc. and then Stantec Inc." The study was completed in April 2017 but kept private until this November when Bloomberg obtained a partially redacted version through a public records request. 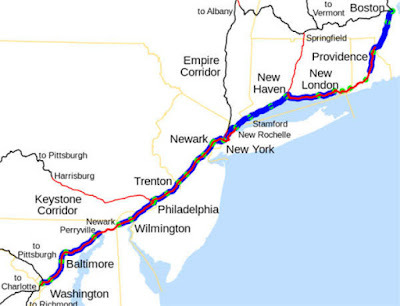 The study, called Amtrak NEC Climate Change Vulnerability Assessment, outlines "the severe threat facing one 10-mile section of the 457 miles of track, much of which runs perilously close to the water." 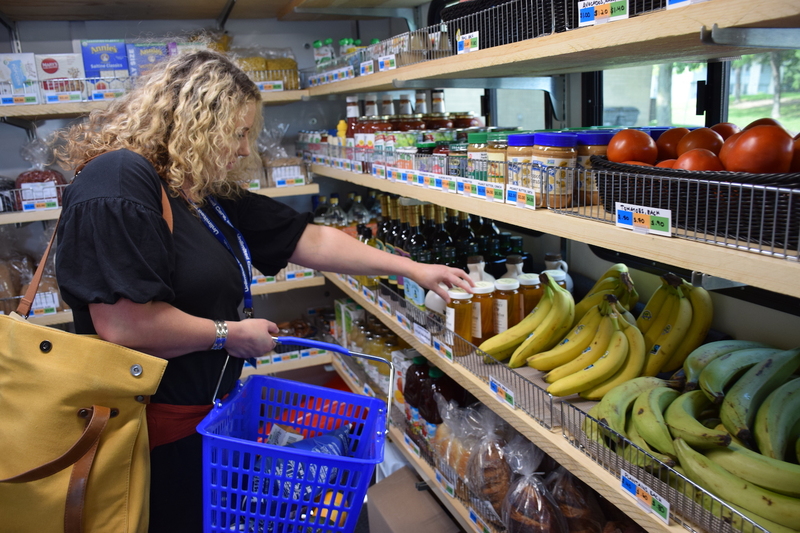 Although the study deals only with the Northeast Corridor, which runs from Washington to Boston, not the Empire Corridor, which runs from New York City to Albany along the Hudson River, it is still food for thought for us here in Hudson. Four years ago today, I learned again something I already knew: Money can buy love when it's an adoption fee. Here's hoping for many more years with my sweet dog, Joey. Crosswalks, urban spaces designed for pedestrians, and "Complete Streets" are frequent topics of discussion in Hudson these days, and the need for such discussions is brought home by this press release Gossips received from HPD Chief Ed Moore earlier this evening. At 11:21 a.m. today, HPD patrols responded to the scene of a car-pedestrian personal injury accident at the intersection of 5th and Warren Street. A 2017 Chevrolet TRX Suburban driven by Robert Mickle, 87 yrs old of Hudson, struck a 66 yr Hudson woman as she was walking west in the crosswalk. She was transported to Albany Medical Center by Greenport Rescue. She appeared to have arm and leg fractures as well as a head injury. The injuries are considered non-life threatening. The investigation is continuing and no traffic tickets have been issued at this time. Although the press release doesn't mention it, Gossips heard from another source that the woman was walking two little dogs at the time she was struck. Last night, the Common Council voted unanimously to enact a local law pertaining to the confinement of animals in motor vehicles. 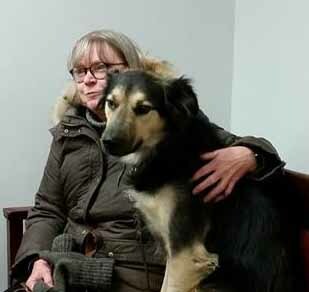 The law was initiated by Alderman Rich Volo (Fourth Ward), inspired by an incident last summer when a dog had been left in a pickup truck for more than a hour in the parking garage at Columbia Memorial Hospital when the temperature was 90 degrees. Volo was distressed that the penalty for such negligence was only a $50 fine. It is already illegal in the State of New York to leave a companion animal confined "in a motor vehicle in extreme heat or cold without proper ventilation or other protection from extreme temperatures," and police officers and agents for the humane society are already empowered "to take necessary steps to remove the animal or animals from vehicle" and seek whatever veterinary care is necessary. What the Hudson law does is raise the fine for leaving a dog in a potentially dangerous situation to not less than $250 and not more than $500 for the first offense and not less than $500 and not more than $1,000 for each subsequent offense. The mayor has scheduled a public hearing on the law for Monday, January 7, at 4 p.m., in City Hall. At last night's Common Council meeting, Alderman Rob Bujan (First Ward) read a prepared statement about the incident that occurred in a public budget workshop at the beginning of November. The comment comes so long after the incident because Bujan had been away at the time it occurred. Here's what he said. I wanted to comment on the incident that occurred at the final BEA meeting at City Hall on November 1, 2018. I realize that we all are incredibly passionate about what we feel is important to the City of Hudson and its residents. However, when that passion translates to assault and, in this case, feces being thrown at an elected official, that is not an unfortunate incident but something that has no place in the City of Hudson. It not only takes away from the issue itself, but when not immediately condemned by leadership, it also opens up a potentially dangerous narrative that could easily escalate to something more untoward in the future. We are a city of laws and one where both residents and elected officials should feel safe to have spirited debate and conversation without being worried about physical harm. Gossips commends Bujan for this statement. 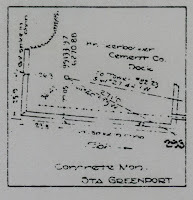 In October--on October 15, to be exact--Mayor Rick Rector held a public meeting, described as a "community conversation," about a new city park to be developed on the remediated brownfield at Dock and South Second streets which was once the site of Foster's Refrigerator. The plan proposed repurposing the existing concrete slab in the middle of the site as a parking lot and developing the area east of the slab—in the front, bordered by North Second Street and Dock Street—as a public park and trail head for the Empire State Trail and the area west of the slab—at the back, abutting the rear of Craftech, the DPW garage, and the waste water treatment plant—as a dog park. At that meeting, no one raised any objections to siting the dog park in this location, except for one person who worried that there weren't enough trees on the site. Even Fourth Ward supervisor Linda Mussmann, who is credited with inspiring the opposition to siting the dog park in Charles Williams Park, seemed to support the proposed location. Tonight, two months after that community conversation, a resolution was introduced at the Common Council meeting authorizing the mayor "to enter into a Memorandum of Understanding with Hudson River Valley Greenway, the Hudson Parks Conservancy, and stakeholders for a dog park [full disclosure: Gossips is on the board of the Hudson Parks Conservancy and is one of the stakeholders for a dog park] to develop a plan for the design and operation of a dog park and trail head. . . ." After the resolution was introduced, Council president Tom DePietro asked if there was any discussion. Among Council members, there was none, but at this point DePietro, uncharacteristically (since he usually defers public comment to the end of the meeting), recognized a member of the audience: Second Ward supervisor Abdus Miah. Miah parroted the same things he said last year when protesting siting the dog park in Charles Williams Park: "The people don't want it. The people don't want a dog park in the Second Ward." Not to be outdone in concern for her constituents, Second Ward alderman Tiffany Garriga chimed in her concerns that "we need to hear from the people." Third Ward alderman Shershah Mizan concurred. DePietro pointed out, "We're talking about a location that cannot be used for housing." Fourth Ward alderman John Rosenthal noted, "It's far enough away from the houses." Fifth Ward alderman Dominic Merante, who was one of the few aldermen who had attended the mayor's meeting about the plan, told his colleagues that the proposal had been "very well received." He went on to say, "This seems to me the ideal area—far away from the houses, far away from the neighborhood." 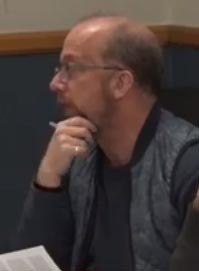 City attorney Andy Howard then weighed in, telling the aldermen, "One thing you will have from this [the resolution] is a design, so the public can express their opinion." Garriga reiterated, "The people in that area have their concerns."